Password JDM License Plate Relocator UNIVERSAL - MiataRoadster - Stay tuned with MiataRoadster! This latest product from Password:JDM, the universal License Plate Re-locator(LPR), is by far the best thing there is on the market. Front license plates in stock locations are usually restrictive on airflow to the radiator and/or intercooler… that’s why you see so many cars without them. Kick that front plate off to one side and coolness is achieved. Like it or not, driving without a front license plate is illegal… you will get a citation, it’s only a matter of time. This re-locator kicks that front plate of yours off to one side giving you that sleek customized look often seen on modified cars all over the world. The difference between this plate re-locator and everything else that is offered is that this one WORKS! We engineered this product to fit both JDM and USDM license plates on nearly all vehicle applications. All the other ones out on the market will only fit JDM plates. Precision cut from T-5052 spec plate aluminum and then precisely bent on state of the art equipment, this plate re-locator is fully anodized black to withstand the harshest of weather. It comes complete with all the hardware you would need for a simple and clean install. Without any question, the Password:JDM license plate re-locator is the best thing there is. This re-locator is available in both left and right side option. The choice is yours, please specify when ordering. Grab one today and get your car looking that much cleaner!!! 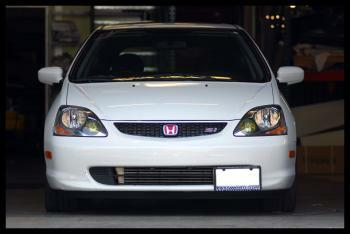 Relocator kit v2 is designed for better fitment for those that have a larger or longer width front bumper. The mounting bracket is about 2” longer than the v1 relocator.